Franco Magnani was born in 1934 in Pontito, Italy, a hilltown not far from Florence which was destined to become an important focus of his later life. went to work in the fields, while Franco and his four siblings took care of the cooking and chores. After the war, Franco became a furniture maker and woodworker, but could not make a living in the declining village of Pontito. 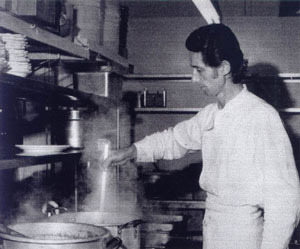 He left his home town to work as a cook in the Italian Riviera, and then as a cook on cruise ships. After travels throughout Europe and the Caribbean, he decided to fulfill his dream of seeing the Golden Gate Bridge in San Francisco.